Black Friday is underway at Apache, with a selection of cracking deals at half-price or less! We’ve picked out four of our favourite pieces currently on offer, from cutting-edge Replay Hyperflex jeans to a heavy-duty Duck and Cover Parka jacket. There’s plenty more great Black Friday offers around, so feel free to browse our online store or drop in to our Horsham shop. Use our brilliant offer code “BLACKFRI” at the checkout for some magnificent, one-off discounts – but hurry, it ends Monday! The world famous Italian brand Replay have set a new benchmark in denim technology with their Hyperflex range. Boasting 100% elasticity, Replay Hyperflex is the gold standard in slim and skinny, super-stretchy jeans for men. The innovate mix of polyester, Lycra and cotton gives you complete freedom of movement, as well as an authentic, quality denim look. And you won’t have to worry about them stretching out or losing shape, even after years of wear. This Black Friday treat yourself to our featured grey wash, which has a clean, smart look ideal for any festive occasion. 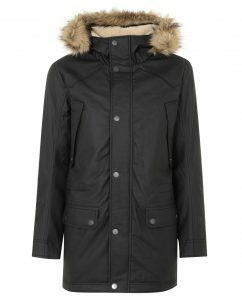 Duck and Cover make some of our most popular outerwear, such as this majestic black Parka. The jacket comes in a zip through style with a button fly front, plus two front button pockets, two chest button pockets and an inside pocket. Due to the generous interior wadded lining, you won’t need to wear a jumper underneath to stay warm, even on the chilliest of days. The coated cotton fabric is great in the wind and rain, and there’s also a detachable faux fur hood to provide that extra warmth. Jiggler Lord Berlue is a Manchester brand that has made waves in the fashion world since 2011. Inspired by the fine tailoring and flamboyant detailing of the late 18th Century dandy Lord Berlue, JLB’s aim is to create stunning contemporary shirts with an eccentric twist. (Click here for an inside look at their JLB’s design process.) Jiggler Lord Berlue shirts are distinguished by their unusual embroidery, buttons and stitching detail. 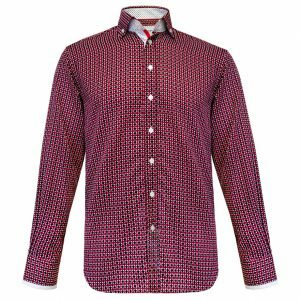 This Dante Retro shirt has a festive feel with a red-rich print, and also features white trim mitred cuffs, a button down cut away collar, and contrasting placket. You will be hard pressed to find a better Black Friday bargain than our Jiggler Lord Berlue sale. 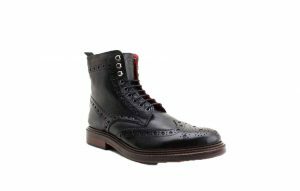 This stunning lace up brogue boot from Base London boasts impeccable 60s Mod heritage, mixing a retro worker boot style with hiking-inspired metallic eyelet details. 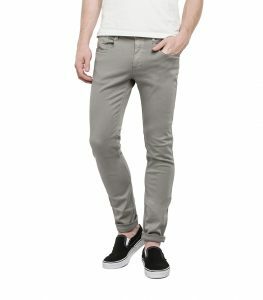 Great for dressing up or down, and fantastic with a pair of slim tapered jeans. The boot uses a soft grain style leather, complete with classic brogue detailing, and a stitched effect sole unit. There’s also a gorgeous red interior lining for that added touch of class. Claim an extra 10% off with our unique discount code “BLACKFRI”!